Roving reporter Bevan has sent a card to Dale. He says "we have had a dream holiday...been to so many places in Italy, all the ropes and spots just magical. We visited Margaret Morgan at her home in Chetmorton - wonderful - she is heading to the Winter Workshop in Auzzie next year - and hopefully will make it over to NZ. We are making our way to London, off to Melbourne, Auzzie on Sunday. Weather comfortable in England - we had 40c in Italy. We have had little sit down and relax time!!!" Showing Moses and Aaron. 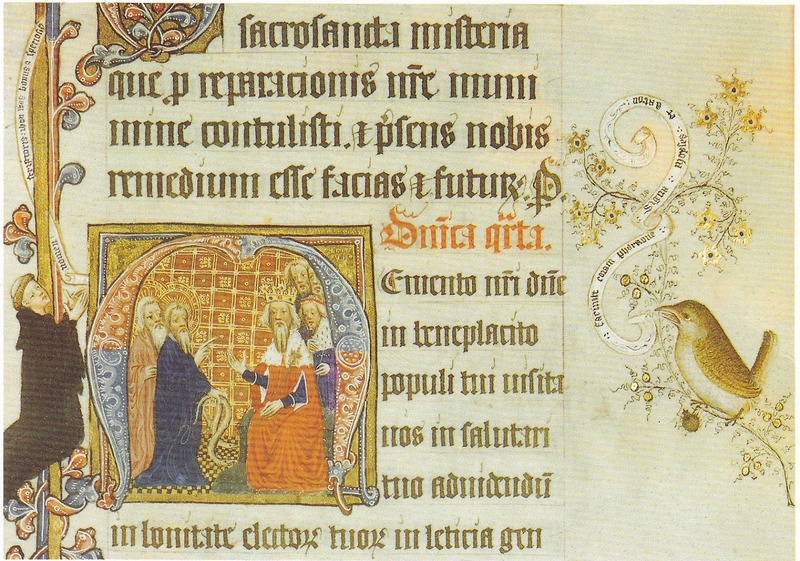 Small print on the back says:- The Sherborne Missal was produced for use in Sherborne Abbey on great feast days, the miniature show Moses and Aaron before Pharaoh. Their rods have changed into serpents. In the left margin is the Sherborne monk John Whas, who inscribed the 600 page missal. In the right margin is a study of a wren with a scroll bearing the words in Latin, 'Moses and Aaron make signs before Pharaoh'. The missal is housed in the British Library.